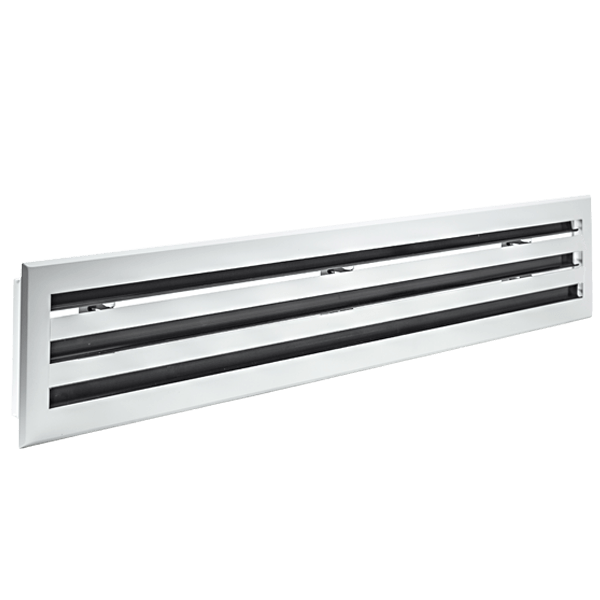 High induction swirl diffuser with rectangular slots. Manually adjustable discharge direction and air pattern, for installation flush with ceiling or free-hanging. The SMARTEMP Slotted Swirl Diffuser, type SSC-AD, offers manually adjustable discharge direction from horizontal to vertical as well as manually adjustable discharge pattern from 4-way to 3-way and 2-way blow. 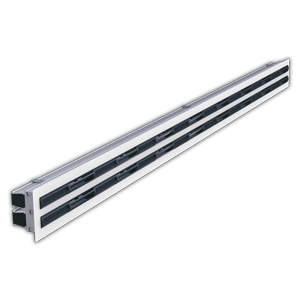 Adjustable vanes with pilot slots (patents pending) allow high airflow rates to be discharged. 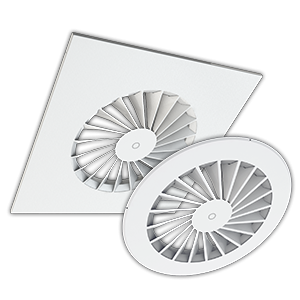 The SSC-AD diffuser can be flush mounted in a ceiling or freely suspended (i.e. no Coanda attachment to the ceiling required). The rectangular vanes are located in the flat square face and are arranged in a circular or square radial array. Each vane is individually adjustable for vertical or horizontal discharge direction for cooling or heating applications, respectively, or can be shut. The latter allows the diffuser to be closed off, or to have 2-way or 3-way discharge patterns. The diffuser vanes are made of black polycarbonate, whilst the flat face of the SSC-AD diffuser is made of powder coated steel. Highly inductive swirl discharge provides rapid temperature equalisation of the supply air stream with room air, preventing cold air dumping, thereby ensuring uniform temperature distribution (no cold and draughty or hot and stagnant spots). High induction also improves heating performance. High induction produces a strong increase in the mass flow rate of the swirling supply air stream, as well as rapid discharge velocity decay. High induction swirl discharge intensely mixes supply air with room air. Strong supply air diltuion with rapid discharge velocity decay produces draught-free, high momentum supply air motion of uniform temperature distribution over short or long throws. Ideal for enhanced thermal comfort (ADPI ≥ 90%). May be used for low temperature (cold air) supply systems (Tsupply ≥ 5 °C), where ∆Tsupply-room ≥ -16 K.
VAV throw dependent upon airflow rate. Minimum airflow dependent upon ∆Tsupply-room (eg turndown to 25% and ≈1 L/s/m2 @ ∆Tsupply-room ≈ -16 K). Air pattern and direction adjustment from horizontal to vertical, and from 4-way to 3-way or 2-way blow. Horizontal discharge provides draught-free cooling; vertical discharge provides effective heating even from elevated discharge heights. Airflow direction and pattern adjustment is manual. 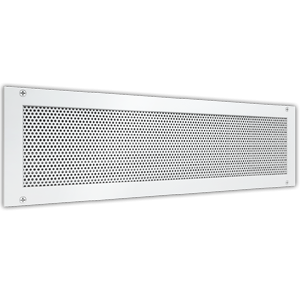 Suitable for standard ceiling grids equal to diffuser nominal size. Custom sizes suitable for standard ceiling grids of up to 600 mm or 24″ available on request. Radially aligned vanes provide highly inductive swirl discharge. Radial array may be square or round. Black plastic adjustable rectangular vanes. Suitable for VAV systems, including turndown to 25% with low temperature supply (Tsupply ≥ 5 °C), where ∆Tsupply-room ≥ -16 K.
3-way blow (270°) or 2-way blow (2×90° or 180°) patterns available by closing relevant swirl vanes. The SMARTEMP Slotted Swirl Diffuser, type SSC-AD, is a high induction ceiling swirl diffuser with manually adjustable discharge direction and pattern. Supply air is discharged in a highly inductive swirling motion that strongly dilutes the supply air stream as it disperses into the space. Supply air direction is manually adjustable from a horizontal radial to downward vertical discharge. The air pattern may be manually set to 4-way, 3-way or 2-way blow. 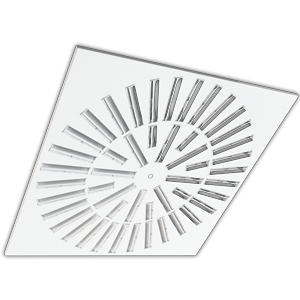 The diffuser may be flush mounted in a ceiling or freely suspended (ie no Coanda attachment to the ceiling required). The multitude of rectangular shaped vanes are made of black polycarbonate arranged in a circular or square radial array, recessed into the flat metal face, which is powder coated. The standard vane setting provides a horizontal, radially spreading discharge pattern through 360°. Each vane is adjustable to vary discharge from horizontal through diagonal to vertical, or may also be individually closed to achieve 3-way or 2-way discharge patterns. The patent pending design allows high airflow rates to be achieved, complimenting the many advantages of high induction swirl discharge. High inductio produces intense mixing at the diffuser discharge surface, strongly diluting the swirling supply air stream with large quantities of room air to achieve rapid temperature equalisation with room air. This prevents cold air dumping and ensures uniform temperature distribution (no cold and draughty or hot and stagnant spots). High induction produces a strong increase in the mass flow rate of the supply air stream, as well as rapid discharge velocity decay. At any given airflow rate, the SMARTEMP SSC-AD swirl diffuser is suitable both for long throws (due to the high momentum of the supply air stream) as well as short throws (due to its low velocity). The SMARTEMP SSC-AD diffuser is suitable both for CAV systems and VAV systems that turn down to as low as 25%, including low temperature supply air systems in which ΔTsupply-room ≥ -16 K. Enhanced levels of draught-free comfort typically achieve air diffusion performance index (ADPI) in excess of 90%. Custom face diameter. Suitable for plaster board ceilings or freely suspended applications.